I've finally gotten around to not only creating something for a contest, but also making a blog entry to share about it. Yay! Since my husband went into hospital, at the end of September, I've only touched any beads that arrived in the mail. Otherwise I hadn't done any creating or even thought about making anything. I still have an unfinished mixed media piece sitting on a tray. It kind of makes me sad, though, if I'm honest. I think of all the pain hubby was in and that he is in fact still in hospital and not fully himself, just yet. 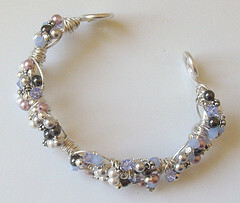 Anyway, this contest is one through a little online store for one of beading forum friends. Her store is called Clearly Chosen, and the challenge is a Clearly Creative Challenge. We were supplied with 12 each of the Swarovski 4mm crystals and pearls. The rest was up to us. I used 12g and 20g sterling silver to create a frame and then added the beads and sterling silver beads and spacers with 28g sterling silver wire. It was fun and I made it in about an hour. Hope you like it, too.